Brick corbel work on second floor and roof gables. The “brick” Barnard building was constructed on this corner in 1883 on the site of the former Jacob Shed House. This was the second Barnard building on Main Street and was often prefaced with the word “brick” after its construction to avoid confusion with the wooden Barnard building formerly across the street at #27-29-31. Jacob W. Barnard was a shoe manufacturer who began his business in the old National Bank building #23 about 1856. Moved into # 31 expanding his business. He purchased the Shed property at auction from the family estate in 1882. The house was turned and moved back on the lot which became 17-19 Barnard Court, later named a street in 1891. Barnard then built a new brick manufacturing building for his business on the Court behind his new retail block on Main Street in 1885. 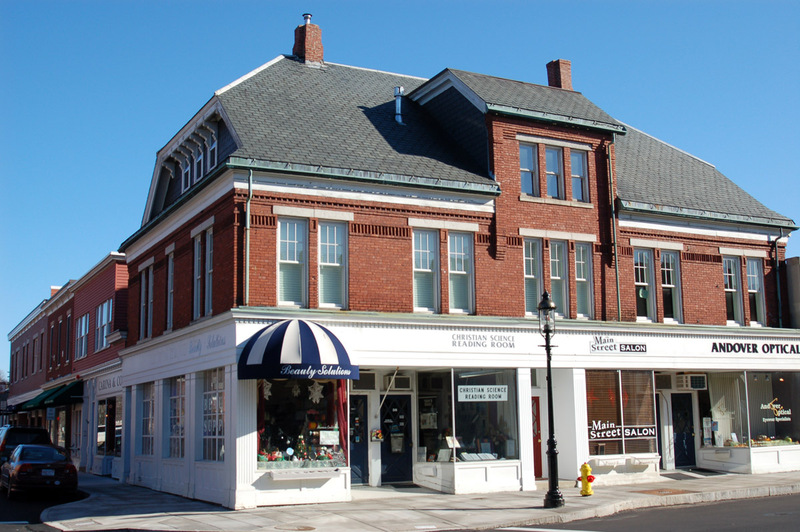 The original construction included four storefronts on Main Street and one on Barnard Street including a side entrance to the corner store. Changing architectural styles & materials through the decades and with each new tenant created alterations to the original store fronts. During the 1940’s black enameled glass panels were applied to the brick above the windows for signage banding with white letters applied. The current lower facade was constructed in the late 1980’s creating a more uniform look. The building is now owned by the Lally II Real Estate Trust but remains connected with the original Barnard family as Patricia Barnard, daughter of W. Shirley Barnard, married Richard W. Lally and inherited the property. The following Andover Advertiser items speak to the construction. May 4, 1883 pg. 2 col. 8 - J.W. Barnard is to erect a brick block this season, on Main Street, next south of the town hall. The main building will be 58 feet on Main Street, and running back 35 feet. There will be a one story extension in the rear, 34 feet by 35 feet. It will be arranged for five stores. The contractors for the work will be Messrs. Abbott & Jenkins of this town, and the cellar and brick work are done by Messer’s Chadbourne and Locke of Lawrence. Besides the contractors Messer’s E. N. Hutchinson & Co., and J. A. Couch of Lawrence, and E. O. Stevens of this town, furnished proposals for the wood work, and Moses V. Gleason of this town, estimated for the cellar and brick work. It is expected that the building will be completed in August. Aug. 10, 1883 AA pg. 3 col. 2 - Barnard’s block is progressing rapidly. Nov. 23, 1883 AA pg. 2 col. 8 - The lower windows in Barnard’s new block are to have plate glass substituted for the German glass now in the sashes. The increased expense by this change will exceed $500. Dec. 14, 1883 AA pg. 2 col. 9 - All the five shops and stores in the first story of Barnard’s new brick block are now let and most of them occupied, and the rooms in the second story are all engaged when completed. Dec. 21, 1883 AA pg. 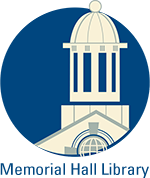 3 J. E. Whiting – moves to Barnard block – has been in town 16 years. March 13, 1885 AA - pg. 2, col. 9 - J. W. Barnard will soon erect a two story building on his vacant lot, south side of town hall. It will be occupied by Mr. Barnard for his own business purpose. Sept. 18, 1885 AA - pg. 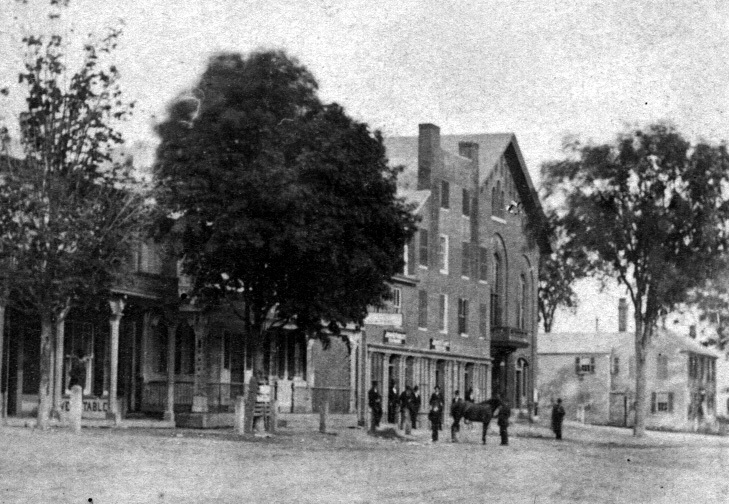 2, col. 9 - J. W. Barnard has removed to his business block just finished, on the south side of the town hall. His office is finely fitted up with new furniture. Oct. 16, 1885 AA - Pg. 3 Col. 1 & 3 Advertisement – Miss M. J. Howard, Millinery – dressmaking – The subscriber has taken rooms in Barnard’s new brick block, south side of town hall…. This building has served as home for many retail businesses in the last 130 years. John E. Whiting jeweler moved into the NE corner storefront in Dec.1883 from the Swift Building across the street at #17. This was Whiting’s fifth and last location since establishing his business in 1867. May 31, 1907 pg. 1 - The store occupied by J. E. Whiting will have more room and better light by the transposition of the Barnard Street entrance into a large window, Hardy & Cole do the work. John Whiting died in 1916 and his son Frank E. continued until his death in 1918. The 51 year old business was purchased by John E. Blackshaw who sold to A. F. Rivard. 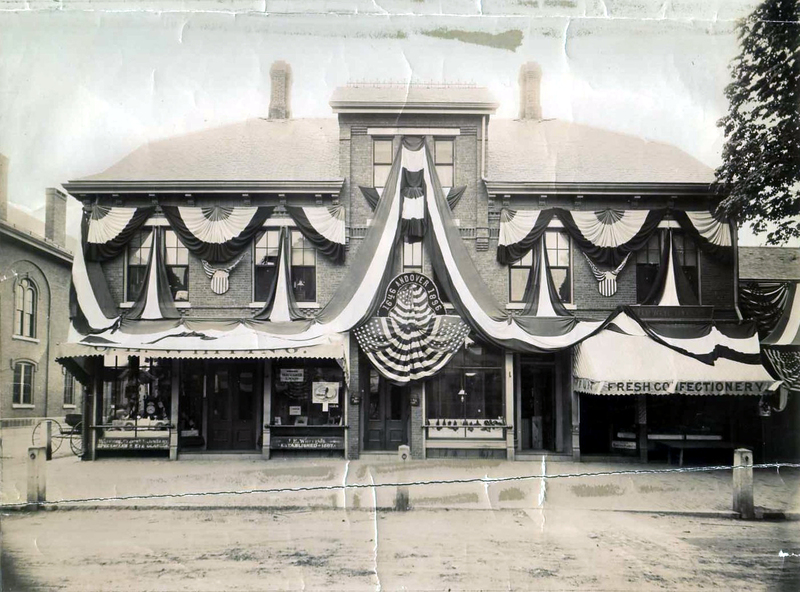 Aug. 4, 1922 AT- Blackshaw Jewelry Store purchased by Albert F. Rivard of Taunton – John D. Blackshaw purchased from the former J. E. Whiting store run by his son F. E. Whiting four years ago.Later owners include George Homer, Dino Artigiani and then Walter Billings. W. Shirley Barnard Insurance Co., the owner of the building, moved his business into the corner store in 1941 and Billings Jewelry Store occupied the next storefront to the south. #36 contained part of the jewelry store but was later returned to a single store front. The Brass Ring 1986 - May 15, 1993 and now occupied by Beauty Solutions. “Just for You” gift shop in the 1980’s & 90’s. The Christian Science Reading Room now occupies the space. Joseph Higgins & B. B. Tuttle of Higgins & Tuttle’s Andover & Boston Express had their office here in 1885. July 6, 1894 – Dr. A. E. Hulme has moved his dental rooms across the street to the very pleasant apartments in Barnard’s Main Street brick block, (second floor) adjoining Dr. J. A. Leitch’s office. Dr. Leitch moved to 107 Main Street and Hulme later built a new home and office in 1899 at 93 Main Street. In 1891 Bacigalupo's market is in the Barnard block.On July 7, 1896 Louis J. Bacigalupo signed a ten year lease with Jacob Barnard, taking over Barnard's store front in his building. He was allowed to remove a small room to the rear for a larger store and the use of the basement. Monthly rent was $17.50. An interesting attachment to the lease is Louis signed over the lease to Sarah J. Bucklin for $1. on June 29, 1896. At #42 . Mrs. Sarah J. Bucklin advertises a Confectionary Store in 1897. Later owned by Mary Dalton about 1908-10. 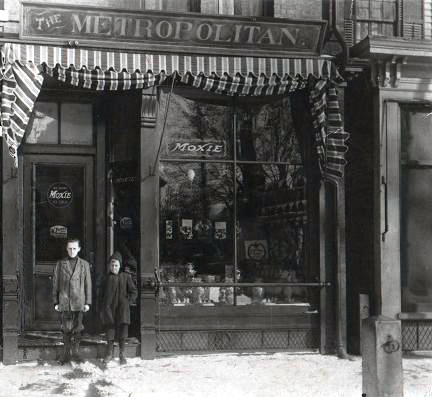 Feb. 8, 1918 AT p1- The Metropolitan on Main Street, for some time managed by Mrs. Dalton, was sold to James Daley – John Traynor was the auctioneer Charles Thiras, the well-known fruit dealer, has leased the Metropolitan Store on Main St. and will conduct a fruit, grocery and vegetable store. He will also continue a candy store. Hood’s Creamery grocer in the 1926-1945, Colestone Foods Inc. 1947- 1950’s followed by Evergood Food Market here in 1953 and continued into the late 1960’s. Andover Optical is now at this location. At #40 Harland P. Wright Shoe store in 1891- 1898? Charles A. Hill & Co. electrical contractors purchased the business of Edward Manning and was here until March 30, 1920. Anticipation Maternity Boutique opened in the 1980’s now the Main Street Salon. Professional offices and apartments occupied the upper floor. Jacob Shed purchased the property from Mark Newman in 1818. Jacob built a house house which faced Main Street on the new Essex Turnpike which was constructed in 1806-09. 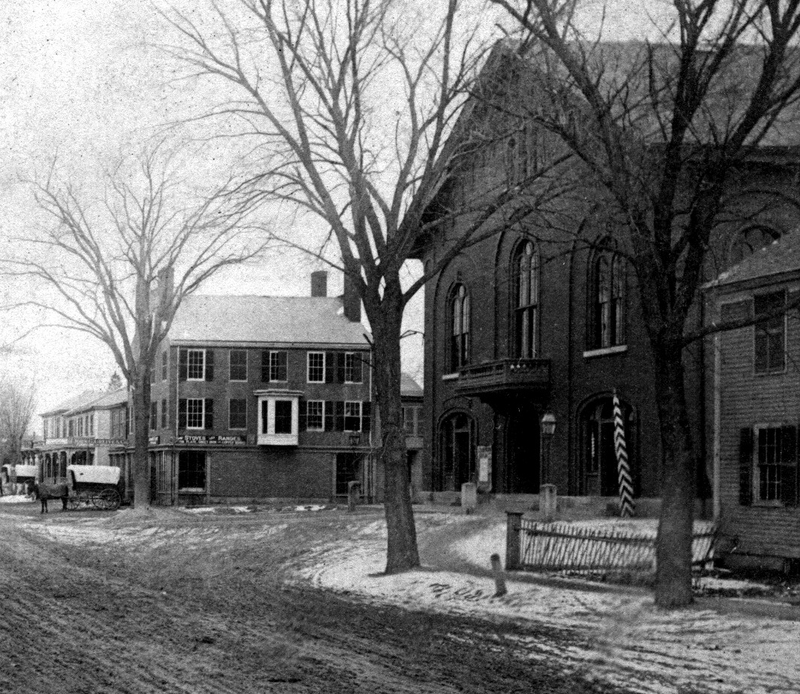 The Town House was built on the adjoining lot to the north in 1859 after Andover & North Andover were divided into separate towns in 1855. Jacob Shed was the son of Jacob & Mary Shed. He was born in 1779 and died April 9, 1850. Shed was married twice. First wife Susanna b. 1781 and died March 26, 1820 at age 36 years. The couple had one son, Charles, b. June 6, 1807. Jacob’s married again on Oct. 15, 1820 to Hannah Nowel b. 1789 and died Sept. 8, 1881 at 92 years. Jacob’s Will divided the property between Helen C. Rea, wife of Charles P. Rea and Anna M. Mayberry, wife of Charles P. Mayberry. Both Helen & Anna were the daughters of Hannah L. Brown. Hannah L. Brown was the daughter of Walter & Annis Brown and married widower, Thomas E. Mayberry, house carpenter on August 23, 1848. Hannah was 22 and Thomas 31 years of age. On Sept. 9, 1854 AA Thomas E. Mayberry advertises his Coal & Teaming business. Hannah & Thomas continue to live here in the Shed home. 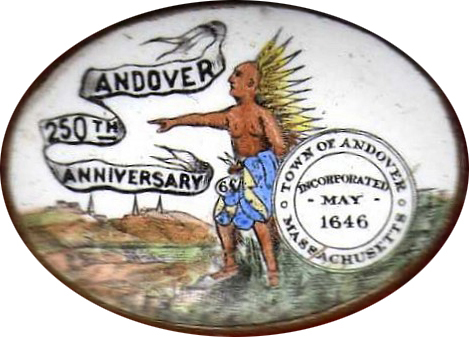 April 12, 1867 AA– T. E. Mayberry & John Cornell dissolves partnership under the name of T. E. Mayberry & Co.
Sept. 3. 1869 AA - Charles W. Higgins is erecting a splendid residence on the lot recently purchased on (#66) Central St. Thomas E. Mayberry is putting in the cellar and George L. Abbott is the contractor for the building. September 16, 1881 AA - Mrs. Hannah Shed who died at her residence on Main St. September 8 was 92 yrs. 1m. 19 days old. April 14, 1882 AA - The Jacob Shed estate will be sold at auction on Tues. April 25th – see advertisement. Advertisement notice - 4 pm – Main Street next south of Town hall a house & barn with 31,340 square feet. April 28, 1882 AA - pg 3 col. 8 The Shed estate sold at auction on Tues. for $5100 Purchaser – J. W. Barnard. Jacob Barnard purchased the property on May 16, 1882 for $4100 which included about 31,340 square feet of land. The Shed house was moved and turned to face north on Barnard St. facing the new Fire house built in 1882-3 behind the Town House. #17 & #19 Barnard Street became a two family home and later used as real estate offices until a fire gutted the building in 2007. Built at cost of $35,000 by Henry W. Barnard his father Jacob W. Barnard (died 1899) began shoe manufacturing company in 1856 in old National Bank building (demolished 1889).